After two days of doing some serious beer drinking today had to be pretty mellow. We went down to Eleven for Liar’s Club Redux. I missed last year’s Liar’s Club Redux at Hamilton’s Tavern but I’ve been told it was one of the best nights of San Diego Beer Week last year. Friend’s raved on and on a few days ago about Black Lie, The Liar’s Club’s 7th Anniversary beer brewed by Pizza Port. Unfortunately we arrived at Eleven today and it was nowhere to be found. The tap list was pretty standard for the bar, no complaints but most of the beers were things that you would expect to find on tap at Eleven any night of the week. The exception was Liar’s Brew ESB, a beer presumably contract brewed for Liar’s Club in the past or Liar’s Club Redux at Eleven. It was far darker and much more malty that I expected from an ESB, not bad but less bitter and more sweet than I would have preferred. In addition to the beer one of the things people seemed to be excited about was the return of some of The Liar’s Club’s famed food. Since Eleven doesn’t have a kitchen we were a bit confused as to how they would pull this off. 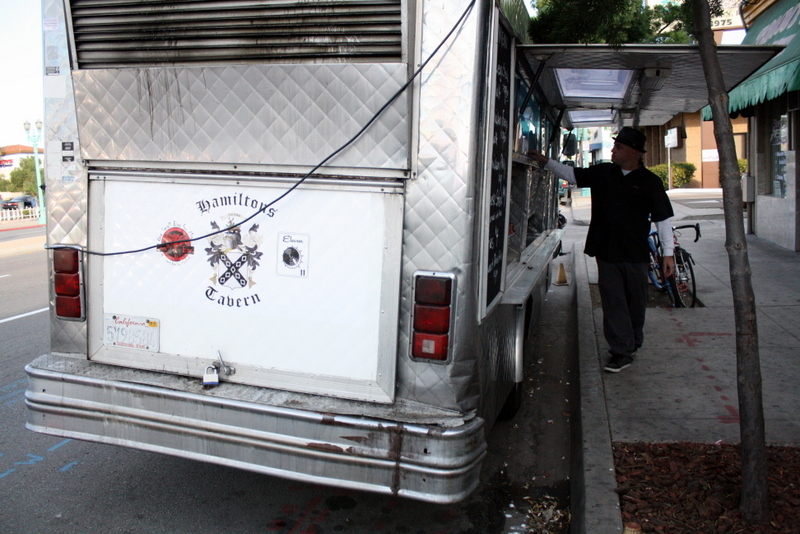 As we walked up to the door we saw the familiar logos of Hamilton’s Tavern, Small Bar and Eleven on the back of a food truck with the familiar Liar’s Club menu. Escovedo Experience (M.E.X) was also there and they seriously rocked the place with their Mexican tinged country rock. There’s something about a drinking a pint of good beer and watching an accordion solo that I can get behind. With seven more days of beer week we need to pace ourselves to avoid getting burnt out too soon, but we’ll be out drinking more great beer this week.